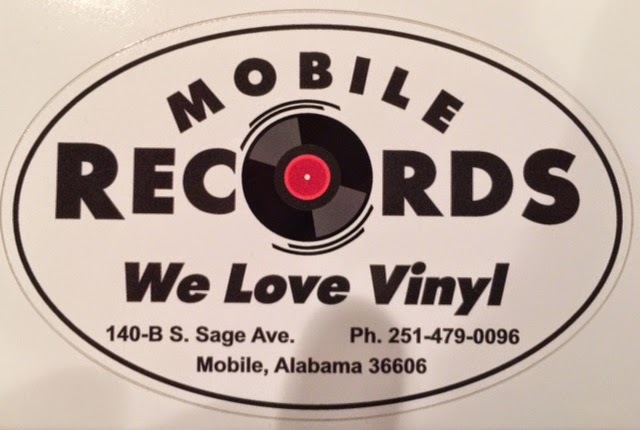 Mobile Records - The last time I was in Mobile back in 2012 there were no record shops in town. I see somebody had the intelligence to open one up here. Good move. No competition. The shop is owned by Keith Glass a guy who moved here from Australia, he's a friendly guy and he and his staff are very knowledgeable about music and helpful as well. The shop is a bit disheveled with LP's packed too tightly in the bins and LP's on the floor that you may trip over but that's a small price to pay to shop in the only record store in town. There are plenty of records to flip through and keep you busy for awhile. Something for everybody. All genres. The condition of some of the LP's well, they were a bit too scratchy for my taste but for someone else maybe that's OK. Don't worry, keep looking you are bound to find something you just have to have. Mobile Records is quite the hang out, during the 2 hours I was there two different people came in bringing with them records to play in store. The owner put them on and everybody listened and then there were comments and discussion. I thought that was pretty cool. I did find several records here at a good price. "Mind if I take a photo of your shop"? "No, go right ahead"! Glad you made it back to town - the 25c sale was sucking air out of the main store that day and yes, some of those cheapies were crispy but we appreciate the recommendation and will try to move a few boxes to higher ground next time you come our way.